My son has had Oral Allergy Syndrome to carrots, celery , apples for a few yrs. He would complain of an “itchy” throat and at times I thought I noticed white papules on his posterior tongue after such fruits or veggies even in small quantities. Pediatrician said to just avoid–not a dangerous allergy and so we did. About a month ago he got an incidental carrot from a salad ( usually we made his salad separate but one snuck in) and within a few minutes he had a voice change and complaint of difficulty swallowing. I immediately gave Benadryl and was getting ready to go to Urgent care when he got better quickly. We were referred to allergist who confirmed he indeed had 4+reaction to celery and carrots and oral allergy syndrome to apples. She prescribed epipen and recommended avoidance…even for cooked. Cooked apples fine. He also has an allergy to several tree pollens, including birch. Just a note of caution if you think it’s just an “oral allergy syndrome” “not the dangerous kind” you may want to have it really evaluated by an allergist with testing to be sure. We were shocked! Soy milk caused me yo rush to the ER…in the waiting room my girlfriend gave me a Zirtec, and i was fine. Throat was swelling and closing fast….. Today, snap peas did it to me. zirtec solved the pronlem. I also get a puns and needles feeling from carrot juice. Glad I found this article. I’ve had a carrot allergy for years, and my son has hd oral allergy syndrome to apples (ER didn’t believe me that was why his mouth swelled). Anyone else get a rash to carrots as well? If I eat something with carrots in it by mistake, I get a very itchy rash that lasts up to 6 weeks in small areas of my body. Since that day, over the course of my life I have developed intolerances to other foods. None life threatening but all with same symptoms. Itchiness of mouth, throat, pulsating of gums and itchy ear canal. These include hazelnuts, almonds, wallnuts, cherries, kiwi, strawberries, apple’s, pomegranates. All with different levels of reaction and all quite fine when cooked. Amazingly I am perfectly fine with peanuts, although my son is anaphylactic to them. Ironic. I do have hayfever for the record. It seems to be a common link in all of us. When ever I peel carrott I get asthma attack. I have to puff the inhaler right away. I thought may be the fertiizer is the issue so I tried with organic carrott same thing happened. When I peel potato it is very mild however with carrott it definitely gives me asthma. Wheezing problem. I have noticed this for a while. I can eat carrott with no problem. Peeling is the problem. Why is that? I am very allergic to carrot. Only to raw carrot. I can eat cooked carrot. Same as Adnan, my Mom don’t believe me she use to make me a glass of carrot juice, every time when I drink it was getting worst, now I am in this point that I can’t even eat or drink anything if was in contact with Raw carrots, that juts close my throat :( I need to have an epipen with me, just in case … Also happens if I eat a lot celery raw. I was big fan of eat salads in the restaurants, but now I don’t like to take a chance, normally they are not sure if the use the same knife . Any way it’s my way to living now, I just eat salads at home or with really close friends how are aware of my allergy. I had a carrot juice drink in a restaurant last night, and had a terrible reaction (sneezing, itching, face on fire, eyes swollen, lips swollen, hives, and mild breathing difficulties). I took anti allergy pill and a few hours later a decongestant (my sinuses were really painful). I’ve never noticed having an allergy to raw carrots, but I wonder if the restaurant prepares the raw ingredients the night before – and I’m suffering the reaction that poster #5 refers to? So I have had a banana allergy since I was about 5 (very allergic), and following that I have developed allergies to peas, and then apples, and raw tomatoes. In recent years it seems I have had allergic reactions to more and more fruits and vegetables, particularily when they are raw. Some of these include oranges, clementines, occasional raspberries, strawberries, roast beef, and others I that are hard to keep track of. it gets exhausting to keep adding foods to this list as I really enjoy fruits but i cannot seem to figure out what is causing these allergies. One interesting note, is that I studied abroad (I am 22) in Italy last year, and had access to a fresh produce market in town where most of the fruits and vegetables were grown locally in Italy (I suspect without GMOs), and I figured I would try a shot at eating some of the things I am less allergic to. In particular, tomatoes and oranges… Before I was unable to ever eat these raw, but I tried the italian ones and I had no reaction, boom. Then a couple of months pass and tomatoes are no longer in season so they begin importing them from other places, and I start to have reactions. Don’t know if anybody else has these common allergies and know what might link them? I wonder also if it could be the preservatives used to prepare them for shipping? While I also have the throat and voice reaction to carrots cooked and raw as well as celery. I have to use an albuterol and QVar inhaler to stop coughing and there may be many more that precipitate hoarseness I was wondering if any of you know about nightshade arthritis? Night shades are tomatoes, any kind of peppers (except black), eggplant, tobacco, and sadly white potatoes. Those of you who have this will hurt all over. Think you have arthritis or fibromyalgia. Try eating Mexican or Italian food and then use some Italian dressing (the kind with little bits of carrot :) ). If you find yourself in excruciating pain all over for several days you may want to Google Nightshade Arthritis. Also Mel Blanc the voice of Bugs Bunny was severely allergic to carrots! And rye bread I would imagine. I have been allergic to raw carrots and celery since childhood. I am 49 now. I’m also DEATH allergic to nuts from trees including coconut. I’m allergic to fish but NOT allergic to shellfish or mollusks. Finally I’m allergic to black Eyed Peas and cantalope, tomatoes, bananas and watermellon. There is no cure for my allergies which saddens me. I would love to try pecan pie or Salmon. I’m not alone in there! How nice that is. I have several allergies (including raw carrots while I have no problem with cooked carrots). I used to have a mild reaction to cantaloupe and to some nuts (especially when eating raw). I used to have a reaction to apricots and celery as well but not anymore apparently. I am really curious to know how it is possible for allergies to come and go. I probably did something right by desensitizing myself for some of them. I am still however avoiding raw carrots like the pleague as even simply peeling them gives me a skin reactions. Birch oral allergy is when the body mistakes proteins in foods for the birch pollen protein. This commonly causes an itchy mouth, and sometimes a swollen tongue after eating certain fruits, vegetables and nuts. Most individuals will also get hayfever symptoms in May and April (the birch pollen season). Usually these symptoms are not serious and are very unlikely to cause dangerous allergic reactions. Some people who react to raw fruits and vegetables find that they can tolerate them cooked. Really great to find this article and especially the comments from everyone. I too have an allergy to raw carrots but not cooked ones! It’s kind of reassuring to know that I’m not alone! I’m not someone who is typically sensitive to things but sometimes raw carrots just seem to get me. Typical symptoms include heartburn and a severe indigestion feeling, almost like a mild cardiac arrest! Choking and difficulty breathing. Interested to hear from others who get the same. Thank you for this article and these comments. I am also allergic to raw carrots. Additionally, I am allergic to raw apples, raw peaches, raw celery, raw mangos, raw kiwi, raw bean sprouts, and who knows what else. I can, however, eat peach cobbler all day and carrot soufflé (Picadilly style). I didn’t develop these allergies until the 4th grade. Apples are my favorite fruit. Really the only thing I can eat raw, safely, is lettuce, cucumbers, tomatoes, bananas (which I hate) and grapes. I’ve had a mild reaction to too many strawberries. I might be ok with blueberries, but don’t like those much. Enough about me… Thanks again! Oh and I have never been clinically diagnosed. I also have a severe allergy to raw carrots, celery, potatoes, and more. I have noticed that the older the fruit or vegetable is, the more ripe it is, the worse my reaction tends to be. I keep liquid Benadryl on hand for times I accidentally come in contact with these fruits and veggies. Has anyone noticed their allergy is worse the riper the food? I love the taste of raw carrots, hate the taste of cooked carrots, not allergic to either and this has nothing to do with texture. Obviously there’s some biochemistry involved when carrots are cooked that results in a very different flavor. Hope some entity scientifically studies this and can supply a detailed definitive answer as to cause – also the percentage of people that hate cooked carrots. This has ramifications for companies that specialize in processed foods (e.g., beef stew, chicken soup, etc.). Wow, this is crazy. I have grown up with hundreds of people and met thousands more. I have NEVER met anyone who is also allergic to RAW carrots. Cooked carrots have no effect on me. But raw carrots, my throat closes and it’s very difficult to breath. Since I found out this effect, I’ve pretty much avoided raw carrots like the plague. But one day about 15 years ago, I thought, let’s see if I’m still allergic. It took about 2 hours before I could breath normally again. But strangely enough I haven’t noticed it with anything else. But it is nice to know that I am not the only one out there. Me too! Allergic to carrots and normally people look at me like I’m kidding. It started when I was a kid and was prepping some carrots. Somehow I touched my eyes and they just got so swollen. Once a tiny 2 mm piece touched the back of my throat and I was weezing for hours. It was great to read your responses and see that I too have had reactions to several other fruits and veggies. It’s a little bit of a struggle since I’m a vegetarian but I just end up cooking and roasting a lot. Peppers, sprouts, apples and cherries are also culprits. I will stay away from birch and mugwort then. Cheers! Raw carrots-even the ubiquitous slivers in pre packaged salads will make my throat swell, and cause the roof of my mouth and tongue to itch maddeningly. The same can be said of certain types of apples-except i don’t know which ones. Some apples I can eat without any adverse effects, and some make me wish I had choked on it instead. Every juicy green or red one is a gamble I hardly ever win. This reaction (for I cannot say for certain if it’s an allergy) also occurs with pecans, walnuts and raw almonds (but not the roasted ones) but not with celery, cherries or any of the myriad other fruits, nuts and veggies commonly associated with this protein. This also didn’t develop until my teenage years-I used to eat shredded carrots by the bag when I was younger. Maybe someday it’ll go away as mysteriously as it came. I just developed an allergy to carrots. Well it is carrot juice. I developed a rash on mu hands and feet after drinking carrot juice. At first I did not know why I had the rash. The second time in 4 days that I drank the carrot juice I immediately got a major rash and itching. It was not in my mouth but on my arms and legs. Yep… the humble raw carrot gets me too. I find that it is a thousand times worse when I consume while I have hay fever. I normally get itchy, swollen eyes, tingly lets on hands and break out in persistent hives with fresh carrot juice.. while they drive me nuts they usually clear up in about 6 hours… but yesterday i had a juice and i am currently nick named Sneezy!… My breathing became so bad.. elephant on chest. interestingly enough the carrots were getting older (re above post about ageing fruit) I used to blame the pesticides used in the “Deadly Dozen” fruit and veggies but when the immunity is low I have found with me it really makes little difference. Id love to get to the bottom of this problem because I feel I am missing out on the benefits of raw veg… sooo glad that Im not alone with this issue! I have allergy to raw carrot, it started when i turned ca. 30. I had a relatively mild reaction for a few years, and then one day i had anaphylaxis. Almost died. I have to carry an epi-pen and obviously i don’t eat carrots (cooked are Ok, i love them). The etiology of that allergy is most likely a cross-sensitization by birch pollen. Somewhere, somehow, we get exposed to birch pollen while having a cold or flu, and – voila. There maybe other mechanisms, of course. I would like to warn all carrot allergy sufferers that other foods that may get you are celery, tomatoes, apples (green ones especially), sunflower seeds, and parsley. Especially if eaten in large quantity, raw, and on empty stomach. I’m so glad I came across this website. I suffer from some of the exact symptoms as described here when eating raw foods such as carrots, nectarines, apples, cherries, and some nuts. So weird. I’ve had it for ages but didn’t think it was a thing and thought it was all in my head – but so glad I’ve found other people who react similarly. Does anyone do anything when it happens – I’m currently having a slight reaction to raw carrot – my own fault! Do antihistamines help? Glad I found this. Thanks guys! My mouth becomes very tingly when I eat raw carrots but no reaction at all to cooked ones. I love carrotts, but have a harder time with raw. Today I was eating a organic carrott and my throat and chest felt heavy. I felt that I needed throw up and did so many times. Still I felt that nothing could go down. Tried drinking water and it just stopped. Threw up again. It was probably a good hour before I felt somewhat ok. It’s now 6 hrs later and I can still feel a small discomfort. I can eat cooked with no problem. I’m 49, my earliest recollection of allergy symptoms was as a young child. I would eat celery with peanut butter and have the sensation of swallowing a string. Back then there was no such thing as celery or carrot allergies…or ADD for that matter. I self diagnosed with the Buffalo Wing movement in full swing as mass consumption of celery and carrots took it’s toll on my ability to breathe…but everyone thought I was making it up as they watched me eat cooked veggies without incident. As a side note, I have a different reaction to eating raw pecans as they make me feel as though I’m being stabbed in my diaphragm…there again, roast them a few minutes and no problems. Since I stopped eating raw carrots and celery, not only have I stopped having any allergic reactions but the women I’m dating seem to be much less crazy…coincidence?? Thank you for this informative site. 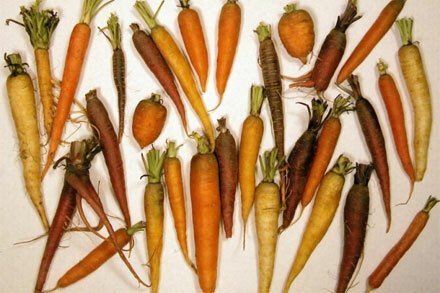 As a child I lived on raw carrots and other raw vegetables. Now suddenly at the age of 60 I can no longer eat raw carrots or celery. Cucumbers don’t seem to be a problem and cooked vegetables seem to be alright. When I eat raw carrots my mouth and throat begin to itch and then my mouth starts to salivate followed by a tightness in my chest and coughing. I so miss my raw carrots. My husband is into juicing and uses a lot of carrots. I keep trying a little bit of juice at a time to see if I can build up a tolerance for these vegetables again but so far it’s not working. I have two daughters,one with multiple allergies, raw carrots for sure, and the other, free of any allergies. Go figure. And I have no allergies . I logged onto this site hoping it would lead me to some process that would remove the allergens from raw carrots. But it’s not to be. I wish you all the best in your quests. First symptom was a tingly throat, then extremely tingly itchy hands. By the time I got back to the villa my entire body was covered in a risen rash and bright red. My throat and nose felt completely blocked. I took an antihistamine and the ambulance crew gave me more through a drip. Much better now, just a sore throat.